A good preparation for breakfast. A treat for Idli & Sambar fans. 1/2 cup assorted vegetables like tomatoes, carrot, beans or potatoes. Heat 2 tsps oil in a pressure pan, and splutter mustard seeds in it. Now add turmeric powder,curry leaves and red chillies and fry for half a minute. Now add the assorted vegetables and saute for a while. Then add moong dal, after washing it thoroughly. 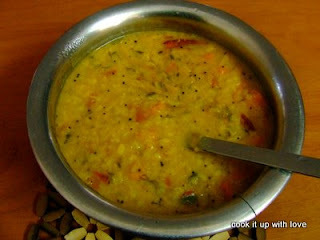 Add 2 cups water ( you can add more water if you want dilute sambar). Add sambar powder and salt to taste. Close the pan and pressure cook for around 20 minutes. Make small idlis out of the batter. In a bowl, place 4-5 idlis, and coat them with ghee or butter. Now add the sambar as prepared above, and garnish with coriander leaves. 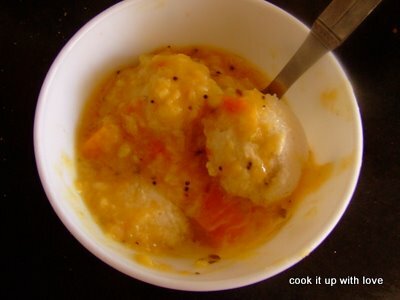 This entry was posted in Quick Bites, South Indian Recipes . Bookmark the permalink.